The City of Chicago during Prohibition and the Roaring ’20s was the apex of excesses, extreme contrasts, and extra ordinary violence. The Windy City was a place where men of questionable morals became extremely wealthy from the sale and smuggling of illegal alcohol, as well as other vices such as prostitution and gambling. Chief among these rising mob personalities was Al Capone. Why do so many people glamorize mobsters and violent crime? No one holds the Son of Sam or Charles Manson in high regard. So why are Capone and his crime minded cronies seen as mythic figures by the general public? Why are members of the mafia treated more like celebrities than unsavory criminals? Part of the answer is historical: The glamorization of the mob started with Prohibition. In the early years of the 20th century, mobsters were just small-time hoodlums. Then came the Volstead Act, which outlawed alcohol. One of the side effects was to solidify organized crime and create a real, international organization out of what was, in essence, small criminal groups. Because Prohibition was hugely unpopular, the men who stood up to it were heralded as heroes, not criminals. It was the start of their image as people who thumbed their noses at bad laws and at the establishment. Even when Prohibition was repealed and the services of the bootleggers were no longer required, that initial positive image stuck. Books and movies such as Mario Puzo’s The Godfather helped glamorize and communicate the notion that mobsters were men who cared about the happiness of their communities and who lived by their own codes of honor and conduct, impervious to the political whims of the establishment. 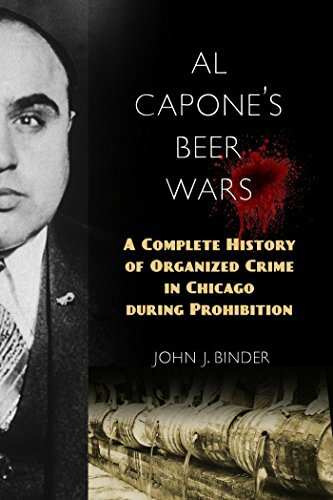 In Al Capone's Beer Wars: A Complete History of Organized Crime in Chicago During Prohibition, author John J. Binder examines the turbulent and complete history of organized crime in Chicago. The author of two other books on organized crime, Binder pulls from his vast knowledge of the subject matter for this in-depth study. A major focus of the book is how the Capone gang—one of 12 major bootlegging mobs in Chicago at the start of Prohibition—gained a virtual monopoly over organized crime in northern Illinois and beyond. The author also describes the fight by federal and local authorities, as well as citizen’s groups against organized crime. In the process, Binder refutes numerous myths and misconceptions related to the Capone gang, other criminal groups, the St. Valentine’s Day Massacre, and other gangland killings. The end result of Al Capone’s Beer Wars is a wide-ranging and comprehensive interpretation of how mobsters like Al Capone and his associates came to control the criminal rackets during the period. Overall, it is well researched and expertly interprets one of our country’s bloodiest and most colorful time periods. This book will most definitely appeal to true-crime enthusiasts and historians of Prohibition-era crime. It is a fascinating and informative read that would make an excellent addition to any library.